This album was added to our database on January 6, 2002, and the album's information was last updated 13 years ago. burque.info is responsible for keeping this album's information up to date. This page has been viewed 20491 time(s). 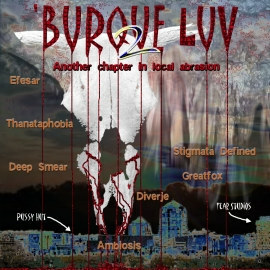 Play all the songs on "burque luv volume two"
published by fear studios (albuquerque, new mexico, usa). all audio and images are copyrighted. all rights reserved. all songs and images used by permission. this promo is not intended for resale. help support local musicians by visiting their websites and by sending email. © copyright 1993-2007 by fearstudios.com ( 186430070+176ms ). All Rights Reserved. Report a bug or make a suggestion.